The year's coming to and end and it was time for the last tournament of this year. 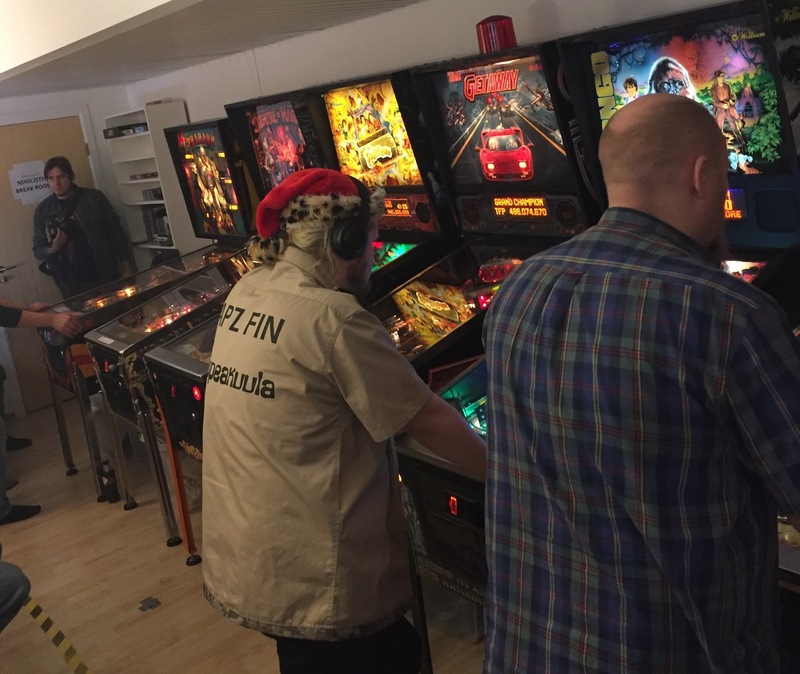 The Oslo pinball club has been on my to-do list for some time now, and we wholeheartedly accepted when we were invited for their Christmas tournament. After the grind at EPC, I had been hoping to just relax and play for just the fun of it. This small tournament seemed like a safe bet for that. It was a Christmas tournament after all, so we came prepared! This was a 2 day tournament, qualification on Saturday and playoffs on Sunday. We arrived on Friday so I'd get at least one good night's sleep before two days of playing. The next morning we set out to find the place and stepping off the bus we ran into familiar faces, who led the way to the pinball club. The venue reminded me a lot of our own place, around 20 pins, from classics to DMD era and beyond. In one of the rooms they had a small kitchen and a large, cosy sofa in another. As a gamer I couldn't help noticing the nice selection of classic consoles as well! The tournament format was match play for the qualification and playoffs being 4 player games with 7-5-3-1 scoring. The qualification was 7 rounds, the playoffs started with top-16 of qualification players, then eliminating 2 per group until 4 players were left for the final. The mix of games was pretty optimal for me. Majority of the games I knew well, some of the classics that I didn't remember by heart were still pretty much "repeat this one shot until you drain". The two wild cards were the Stern Star Wars and Guardians of the Galaxy. I had played the Star Wars before, but was a very long way of having a viable strategy for it. The other game again was a first time for me, but fortunately it was also new to other players as well, and its software was still pretty much work-in-progress, like sadly is the case with all the Stern games these days at release. I got to play the Guardians of the galaxy on the first round. I left it with somewhat mixed feelings, the graphics and sound track were excellent, but the software felt really half-baked. The game itself played pretty much like all the late Stern games; select a mode, get to see the shots you're to make before hand and then just keep on nailing them. I never got to play the Groot-multiball because the lock mechanism didn't seem to work as expected. I started the first round pretty strong by winning a game of High Speed II. I've come to dread it as it's often very hit'n'miss game for me in tournaments. The following rounds were pretty steady playing for me, even the crappiest of rounds rarely ended up with me getting just 1 point and if they did, I usually countered with 2 strong games afterwards. I got to play more than my share of this Congo! As the tournament went on, I found myself enjoying playing in a tournament first time in a very long time. Much of that goes to the general atmosphere in the place. Unlike in many other really serious tournaments, people here complimented each other on good games. Somewhere after the halfway we had a lunch. I'm so glad the organizers had food served at the arcade (and it was included in the ticket price!). The arcade was in the middle of an industrial area and I have no idea where else we would have found food, save ordering by phone. Some games just seemed repeat for me over and over again, even when everything was randomized. Flintstones, High Speed II and Congo became very familiar to me. Congo is one of the games that I mostly like because how it plays, the theme does very little to me, going from meh to downright annoying. Still, it works pretty well as a tournament game, like it did here as well. The High Speed II was really fast and the ball was all over the place. Flintstones again ... was just being Flintstones. I didn't bother doing anything else but to gun for the multiball and super jackpot. That worked in surprising amount of times. Towards the end I played a rather stellar round of Bally's Lost World. It was a 4 player game, where every player managed to play a really good game and we ended up within 9000 points of each other! After a day of playing I was safely in the top-16, ending up as 9th. There was also a side tournament, which I probably shouldn't even have attended, but did and absolutely nothing came out of it as I was dead tired at that point and fell into the hotel bed face down as soon as we got back. We returned the next day for the play-offs, which were 4 player games, 3 games per round. 2 best players from each group went to the next round, so with 16 players the final was 3rd round. The play-offs are ready to begin. We had Pharaoh, Congo, Flintstones and Indiana Jones, with Ole, Emma and Morten playing with me. Save the Pharaoh, the two other games weren't exactly new to me after the qualification! I had played Pharaoh couple of times before this, but didn't really have a solid strategy for it. Pintips didn't help me much, so I just observed what the others did. It obviously had multiball, but I couldn't find the lower lock. Still, not a total loss and I took 3 points. Next up was Congo. I got my game going from the get-go. I found the super skillshot easily and played the main multiball, Diamond hunt multiball and Ghost tribe multiball. Emma from our group commented that she had never seen the Ghost tribe multiball before. I've actually seen so many players completely ignoring the Jungle jackpot countdown, thinking it's a one shot thing, but instead it gives you a two ball multiball! Next was Flintstones, where I barely got the multiball going, but still got at least 3 points. Last game was Williams Indiana Jones. I got a decent multiball going on and played some modes, chasing Morten all the time, but not quite catching him in the end, 5 points. After the last game I was tied with Morten, so we went to the semi-finals from this group. With 8 players left, half of the players here would go to the final! Getting this far had already exceeded my expectations of today's games as I'm not really a morning person. I went against Trenton, Magnus and Øyvind on Indiana Jones, Theatre of Magic, Sky Jump and Guardians of the Galaxy. We started with the Indiana Jones, where I played a rather steady game, progressing as planned and staying in the lead through the whole game, for rather satisfying 7 points to begin the semi-final. Theatre of Magic was still being played by another group, so we went to Sky Jump instead. It was a rather harsh single player EM game. I was the last player to go, so I knew the scores I was aiming for. Trenton started the game with a very nice run, Magnus again almost ended up with 5 house balls. I had a pretty shaky start and only got my game going with the last ball. Sky jump is one of those EM games, where you have to very carefully build your game and then score insane amount of points for doing very little. It has a large drop target bank with two lights under each drop: 500pts and 10x. By default the targets are worth 50 points, which is jack here. Instead, you want to first complete the roll overs to get them all lit for 500 points. Then the middle bumper moves the 10x multiplier. Hit the 5000 point drop, move the multiplier, get another 5000. Easier said than done, but pretty neat rule set for an EM game. I got past Magnus in the end and got 3 points. Could have used more. Next up Theatre of Magic. This was a very even game, everyone playing the multiball and I recall towards the end we all were within 200M of each other. I started my last ball with multiball lit (but no locks, thanks to the multiplayer lock rule). Locked 2 balls and then tilted the machine from a panic slap save. Aww crap, 1 point. This could really hurt. Apparently I wasn't the only one new to GotG, as we got the room full of audience! Last was Guardians of the Galaxy. Second time ever I get to play it in my life! I selected a mode that had couple of doable shots lit, then plunged. As I flipped to move the skillshot rollover lane, the mode changed! Now I had a mode where only one shot was lit and I spent two balls trying to make it. I only got it with my last ball (and it netted some points), but other than that it was still more of exploring the game than actually playing a tournament entry. Still, it was enough for 2nd position and 5 points. After the round I looked at the points. Oh man, that Theatre of Magic screwup dropped me from the game. If I had caught the 3rd player, I would have tied with Øyvind for a tie-breaker game for a place in the finals. Out from the semifinals. Well, it was a good run. I qualified in the main tournament as 9th of 16 players to be qualified. I was eliminated in the semi-final, and was 5th in the tournament. I didn't qualify in the side tournament. 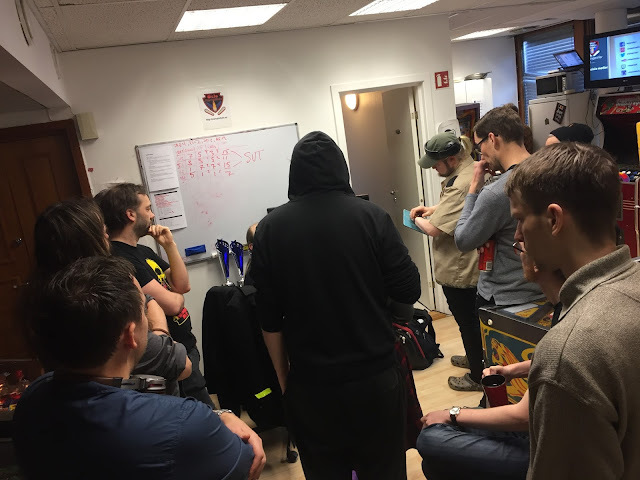 It's been a while since I've attended a tournament that didn't have 100s of players and to be honest this was something I had been missing. 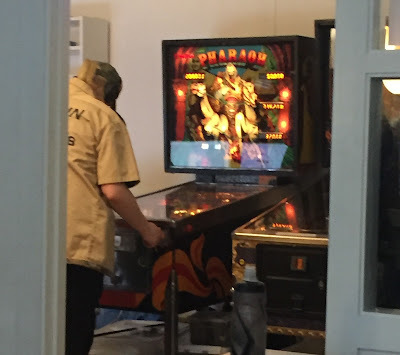 This whole tournament was so light-hearted and fun, with people obviously playing because they like pinball and not because they needed to crush opponents to win WPPR points. It reminded me a lot of the Finnish pinball league from the early years, before it turned into way too serious. Still, this made me think about rejoining the league and see if I'd find any of that good old time spirit there. 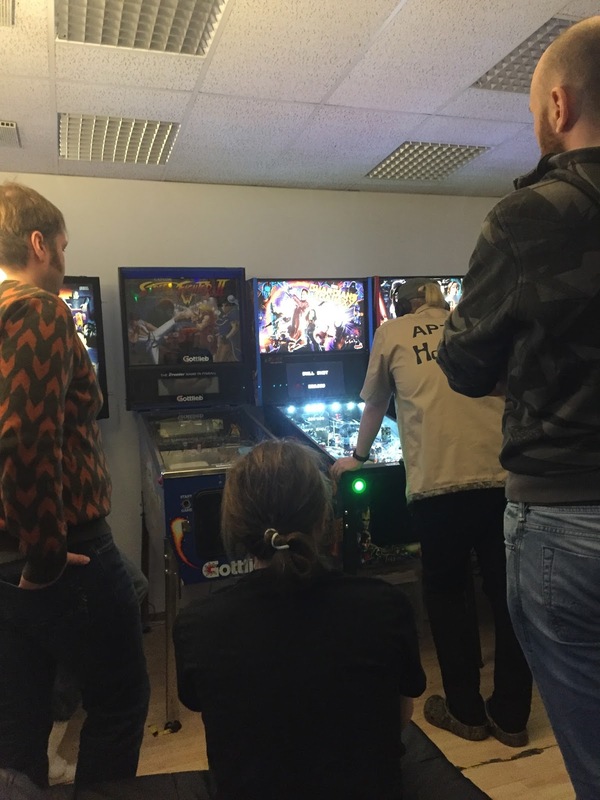 Oslo Pinball club had a really nice collection of games, everything very well maintained. I was so glad to have accepted the invitation and hope to return with the whole Hopeakuula crew some day next year. Nevermind me. Just admiring the turbine here! Preparing for the upcoming INDISC game I was packing my stuff and noticed my headset had gotten damaged on our way back to Finland. Someone had crushed my backpack with a hard hand-luggage suitcase and killed the left hinge. I really hope I can either buy a new set or patch up these as having noise cancellation headphones has become pretty important part of my playing accessories. I used to play with those tiny in-ear headphones, but I had to crank up the volume to make the background noises disappear, often leaving me with ringing ears in the end of the day. With these I can listen to music all day long without any negative effects. They're also wonderful on airplanes on 10+ hour flights.